Public Health England’s (PHE) Change4Life campaign launched on Wednesday 2 January 2019. Children have already exceeded the maximum recommended sugar intake for an 18 year old by the time they reach their tenth birthday, according to Public Health England. This is based on their total sugar consumption from the age of two. 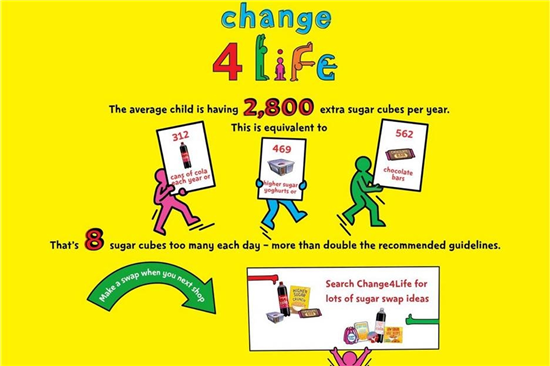 This figure comes as a new Change4Life campaign launches, supporting families to cut back on sugar and to help tackle growing rates of childhood obesity. While children’s sugar intakes have declined slightly in recent years, they are still consuming around eight excess sugar cubes each day, equivalent to around 2,800 excess sugar cubes per year. To help you manage this, Change4Life is encouraging you to ‘make a swap when you next shop’. Making simple everyday swaps can reduce children’s sugar intake from some products (yoghurts, drinks and breakfast cereals) by half, while giving them healthier versions of the foods and drinks they enjoy. -a higher-sugar breakfast cereal (e.g. a frosted or chocolate cereal) for a lower sugar cereal, to cut back from three cubes to half a cube per bowl. The launch of the campaign will also see the release of new TV, radio and digital advertising as well as a brand new short film which brings to life key statistics around children’s consumption of sugar. Families are encouraged to look for the Change4Life good choice badge in shops, download the free food scanner app or search Change4Life to help them find lower sugar options.